great photo! love his moustache and beard, and the shirt is so original! LOve it. great pose too. Reminds me of LF Markey. who knew santa was stylish. Nice shirt and double breasted blazer. I remember seeing this gentleman a few times on this site a while ago. Epic swag from this old gentlemen. You’re never too old to be dapper. Beatiful double breasted jacket, nice glasses, good moustache and beard, and ungraceful shirt. Great shot, love this guy! I want to be him in future. Such an elegant man. Love his shirt.. The Navy Linen DB sport-coat, should be in all men’s wardrobes! 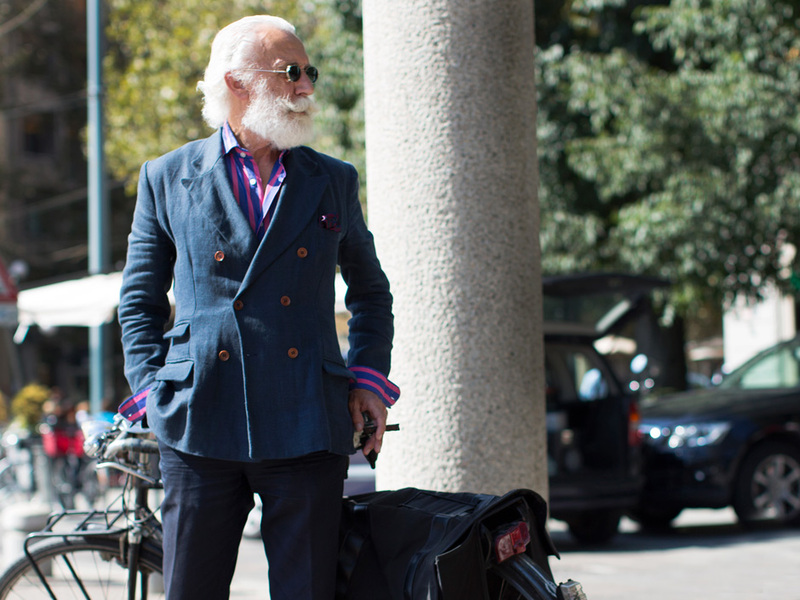 Men in Milan are the best dressed men in the world. The wear all short of combos and colours and scarves etc. but they always look sharp and not feminine. I only take fashion tips from them. Thanks Scott for sharing, you should publish a book with men in Milan. Rob De Niro meets Captain Birdseye. Nice look. I’m into fashion now. This gents style is perfect! Is he in the fashion industry or just a regular guy? The Stylish Cyclist, Giuliano Alborghetti strikes again. Always appear so at ease with himself. Is this Wanny Di Filippo? Either way, perfecto. What a brilliant Db, and a strong pose!